When it comes to menu planning for your next holiday or private party, getting the proportions just right can be a headache. Overestimating can leave hostesses with more leftovers than they know what to do with and a hefty grocery bill to boot. But the other end of the spectrum, running out of something mid-meal can shine a negative light on your otherwise perfect party. Knowing how much of each food item to purchase and prepare is a big part of successful party planning, and I've created a handy guide to help. Before heading out to buy ingredients, use your time party planning to avoid confusion at the grocery store. 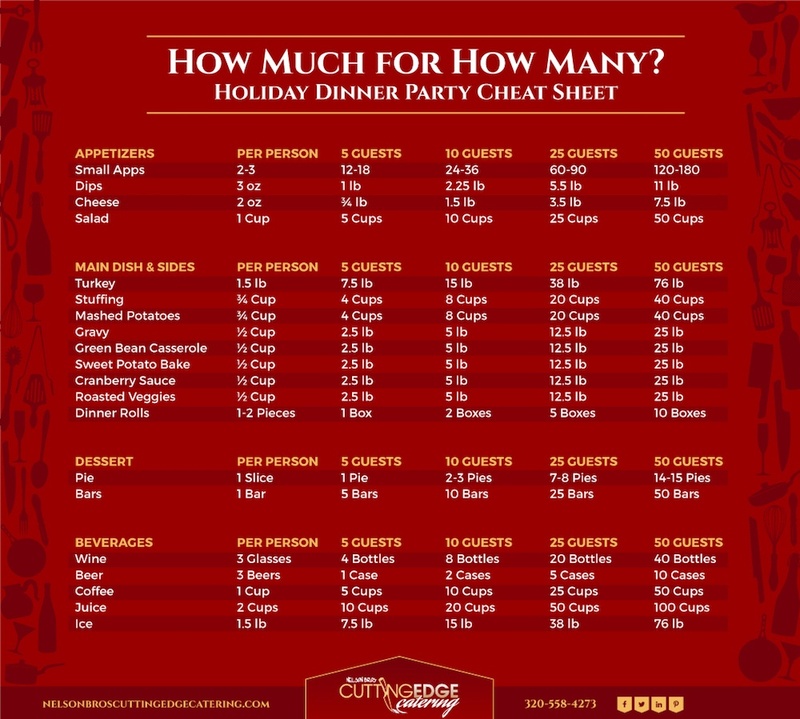 Use our infographic to know how much holiday food you need based on your number of guests. If your number of guests isn't represented in our party planning infographic, take the amount in the "per person" column and multiply the amount by the number of guests. When it comes to putting on a great private party, getting the meal just right is almost an art. The guidelines above can easily be adjusted depending on your guests. For instance, increase the amount of gravy if you know some of your guests like to pour it over everything. Or, if no one touched the cranberry sauce last year, you can probably get by with a smaller portion. Beyond the food, ensure you have the right amount of dishes, platters, and utensils to hold and serve each dish. You'll want extra silverware for dessert and plenty of napkins, just in case. If you do this, you'll set yourself up for a successful holiday meal and private party. After all, food is an experience we all share, and your guests will remember their experience long after the party wraps. While some truly enjoy party planning and all of the shopping, preparation, and cooking that comes with it, there are others who would rather spend their time on other projects and tasks. Remember that the responsibility of preparing your holiday meal can be handled by a private party catering company. If you're looking for a private party catering company in St. Cloud or the surrounding areas, food preparation doesn't have to land on your shoulders, unless you want it to. If you prefer, you can always leave the job to a catering expert.